Jose Principe’s research is directed toward the development of new paradigms for information processing. He has been investigating ways to conquer the difficulties found in capturing information of faint signals buried in noise and in transmitting them as reliably as possible over real-world channels at high data rates. Principe’s research has two fundamental components: theoretical work developing neural models for signal and information processing, and applications of the theory to practical situations. Two recent, important theoretical contributions are his invention of the gamma neural model and the development of an information theoretic learning criterion. These and other algorithms have been applied to speech recognition, echo cancellation, system identification and control, recognition of objects in radar imagery and biomedical applications. 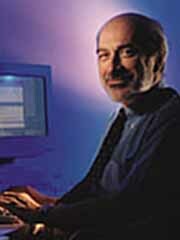 Principe founded the Computational NeuroEngineering Laboratory (CNEL) to serve as a center of collaborative work with colleagues within his department, the university and other national and international universities. Between 10 and 15 graduate students work at any given time in the CNEL.